VertiRack now offers Industrial Wall Mount Ladder Racks. Ladder storage can be a complicated issue in industrial and commercial settings. 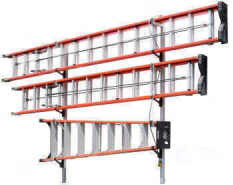 VertiRack offers wall mount ladder racks to satisfy "Proper Ladder Care and Storage" requirements. Safe, secure storage for your ladders, out where they are convenient to access but up on the wall to avoid damage.